BRITAIN is in an "enormously strong" position to become the world leader in stem-cell research, the government's chief scientific adviser said yesterday. Sir David King said there were economic and health benefits to making the UK the global hub of the controversial biomolecular research. The UK may benefit from an influx of cash as US stem-cell firms face vocal and politically powerful opposition. President Bush recently vetoed legislation on embryonic stem cell research. 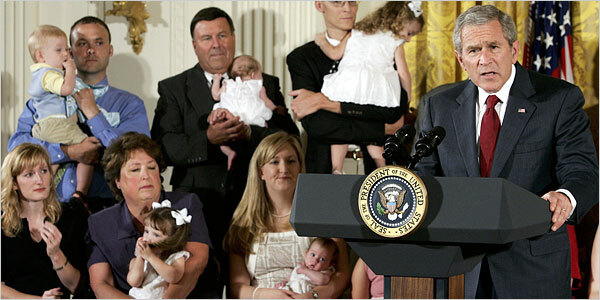 He gave an announcement surrounded by babies who were adopted while they were embryos. [...] we must also remember that embryonic stem cells come from human embryos that are destroyed for their cells. Each of these human embryos is a unique human life with inherent dignity and matchless value. We see that value in the children who are with us today. Each of these children began his or her life as a frozen embryo that was created for in vitro fertilization, but remained unused after the fertility treatments were complete. Each of these children was adopted while still an embryo, and has been blessed with the chance to grow up in a loving family. These boys and girls are not spare parts. They remind us that we all begin our lives as a small collection of cells. And they remind us that in our zeal for new treatments and cures, America must never abandon our fundamental morals.